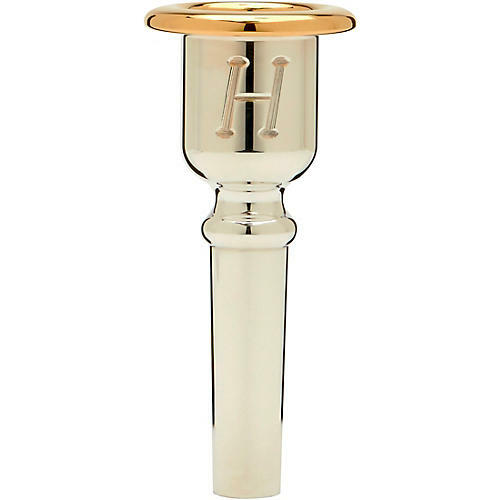 The Heritage Series tenor horn – alto horn mouthpiece has a large amount of mass around the throat and backbore, with thinner walls towards the rim. This design makes the mouthpiece very responsive at soft dynamics and in the upper register with easy articulation, while producing a massive sound in the lower register and at loud dynamics. A great choice for the classical-focused player, the Denis Wick Heritage Series mouthpieces are available in the same sizes as the standard Classic Series mouthpieces. 1: 19.50mm cup diameter; 5.82mm rim width; 5.20mm throat; V-type backbore. The widest and shallowest mouthpiece. Strong low notes, ideal for 2nd horn players. 1A: 19.50mm cup diameter; 5.82mm rim width; 5.20mm throat; V-type backbore. Slightly deeper cup than the model 1 with great pedal notes. Ideal for strong and low note players. 2: 19mm cup diameter; 5.82mm rim width; 5.20mm throat; V-type backbore. Wide mouthpiece with a big, open sound and powerful low register. 2A: 19mm cup diameter; 5.82mm rim width; 5.20mm throat; V-type backbore. Deeper cup than the model 2; extremely rich sound with great flexibility. 3: 18.50mm cup diameter; 6.07mm rim width; 5.20mm throat; V-type backbore. Ideal for any band setting. Excellent accuracy, projection and response throughout all registers. 4: 18mm cup diameter; 6.07mm rim width; 5.20mm throat; V-type backbore. Slightly smaller diameter than the model 3, but with an easier upper register. 5: 17.50mm cup diameter; 6.35mm rim width; 5.20mm throat; Open-V backbore. Deepest and most narrow mouthpiece. Very flexible and rich toned with a resonant, full upper register.